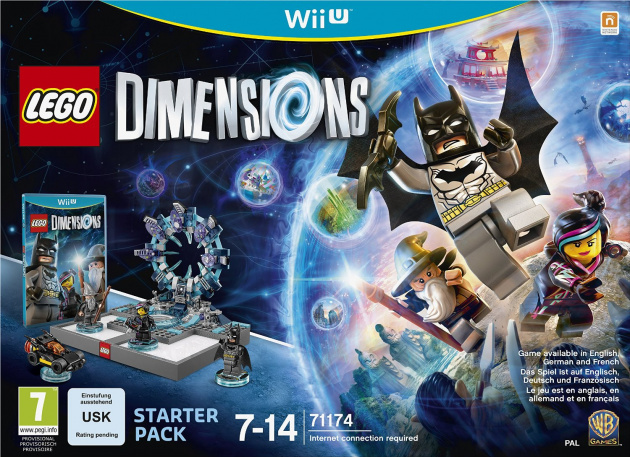 Lego Dimensions is a Near Field Communication game based on Skylanders and Disney Infinity. It plans to features characters and scenarios from DC Comics, The Lego Movie, Lord of The Rings, The Wizard of Oz, Ninjago and Back To The Future(!) and will likely feature a large use of vehicles. Much like many other NFC games, it has an eye-watering price tag of £89.99 for the base set, which doesn't include the other characters and areas available (You have to pay £29.99 to play as Marty McFly. Tsk). So what do you think of this game? Excited? Uninterested? Appalled? As a fan of the Lego games (heck, my old username was Lego Master) I really want to have this game - though the NFC style puts me off completely. It makes perfect sense as it fits on with the use of Lego brilliantly - though I don't have the funds to get dull enjoyment out of it. Could be a gold mine for Lego, I'm not interested in it myself but it will be good to see if anything different can be done with the Lego format nearly all of the Lego games have become known for. Do you have to build them before you can use them? I stated on a similar thread that I love Lego games. But amiibo is the only video game addon/ collection I will allow my bank account to deplete for. Lego video games are fun fun fun and for those not really choosing to collect anything at the moment it could be an option. Content is lessened if you decide to get the starter pack and 1 other pack or even nothing more = there's no point if that's what you think you would do. Since when should one game and all of its content be considered to cost £150+ ! thats ludicrous .. case in point those blummin Skylanders that kids can't even give away now, that cost £7 - 15 initially. Sounds interesting, but far too expensive for me to get it £100 too steep even for Lego. Game wont have room for actual games with the ammount of plastic peripheral items on sale, with this, skylanders, Disney Infinity, and the return of Rock Band. Guess what just got announced? Well, leaked. That article has the pictures, and I can see many people flocking to buy this up. If only for that K-9 figure. About bloody time too. I've been calling for a Lego Doctor Who Game since as far back as the Tennant era of the Series because seriously what greater fit would these two franchises make? And it would finally help Doctor Who to "work" as a video game too considering the Lego game mechanics and gameplay involved. Is Kesskuron gonna do stop motion video's with lego. Have to say the Doctor Who set does make me quite excited but as much as this game sounds awesome, with so many franchises in one game, it's just going to be so darn expensive.